President and CEO, Kevin Hoag is the foundation of Greatwood Custom Furniture and Design, Inc., and Greatwood Murphy Beds. He comes to Colorado Springs after running a 53 year old, third generation family furniture business in Scottsdale, Arizona. 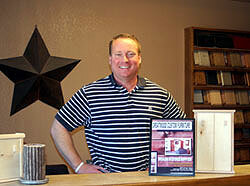 He opened Greatwood in 2006 and brought with him 15 years of furniture making and custom finishing experience. "We believe that the measure of a company is the way they treat their customers. So with every purchase we make this promise to you. Great quality, great experience, great value and great service-guaranteed!"